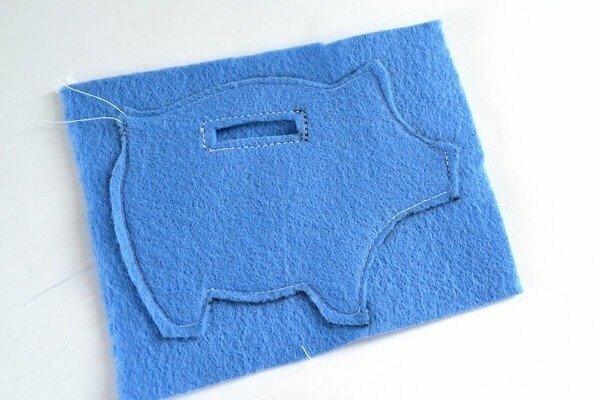 Get the free pattern to make a whole mess of felt piggy banks. Easy, cheap and a great little gift! At any given time my purse weighs a good 4 pounds more than it should because of change alone. It’s insane. And it gets worse because when I go to pay I just can’t seem to dig out enough change to make exact change. So I sigh and hand over bills and toss my new change into the bottom of my purse where it can make friends with the billion other coins lurking in the shadows of my lip balm and cell phone. And the thing is, change can really add up over time. I mean, once a big vase (that came up to just above my knee) of change here at the house was cashed in and it had over $700 in it! Which was great because somebody just so happened to run into my garage door and break it messing around. I had hoped the change would help out but I had no idea it would cover the cost completely. So these days I make an effort to put my change into a “savings” account and boy does it add up. 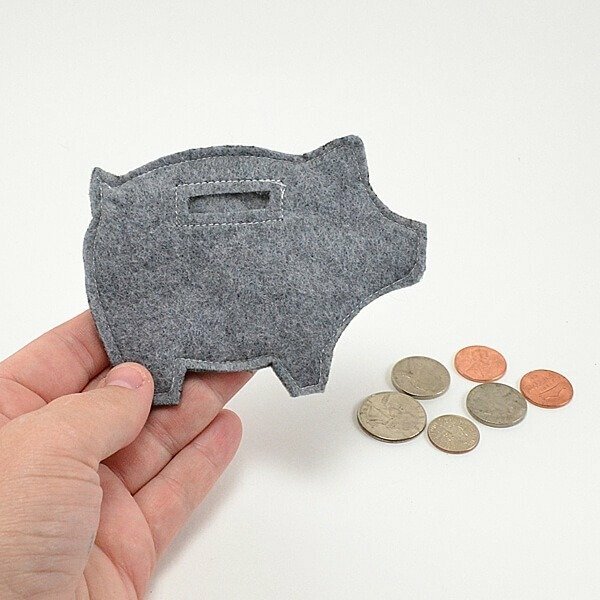 So I thought, why not make little felt piggy banks that I can toss in my purse and keep track of my change with. Because a fuzzy, fat pig in the bottom of my purse will be much easier to grab a hold of! 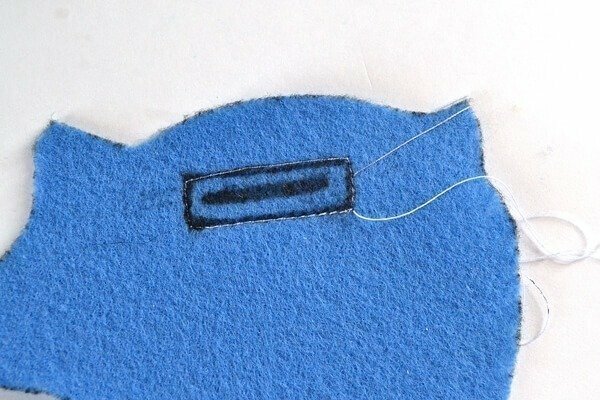 Cut your pattern out and either trace onto your felt with your marker or pin to the fabric and trim around. Mark the area for the slot and draw a rectangle around it. FYI – you can use a disappearing or washable fabric pen and you won’t have these lines that I do. I’m using black so you can easily see what’s going down in piggy town! Sew the rectangle around your slot. And trim out the opening with scissors. Folding the pig in half helps to get the cut started. 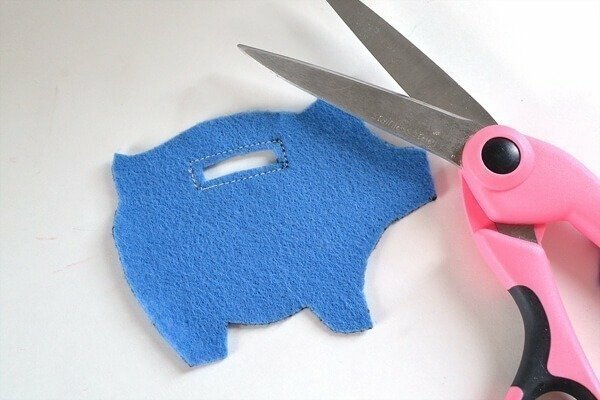 Sew the pig onto a piece of felt and trim away the excess when done. This helps the front and back be the same without having to worry about either slide slipping and getting all wonky on you. Fill with change and this project is a wrap. Well, unless you have more to make! Made in lots of fun colors, these would make great little gifts! Make one (or several?) I’d love to see them! This is the cutest idea! I agree with Midsommarflicka! I’m going to make a stash of them to always have ready for birthdays/graduations/baby showers and the list goes on. Love these! May need to sharpen my sewing scissors to cut the felt, though :-). what a fabulous idea, I love it! I think the Velcro would be a great idea. You can pull it out of the “hole” but it can stretch out the felt a bit if not careful. OMG, this is the cutest thing on the east coast!!!!! My son will LOVE this!! 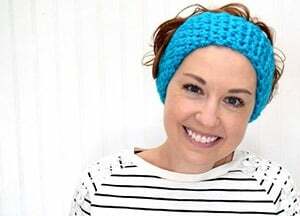 Thanks for sharing at She Can Sew…that’s how I found you. Off to check out your site! 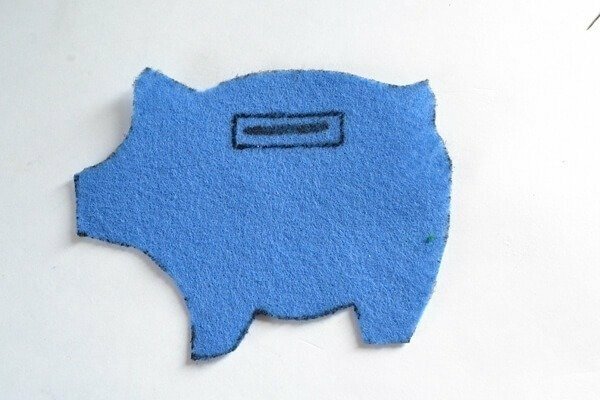 I loved this so much that I traced the pig pattern in my digital cutter software and cut out, then placed it on some pretty pink nylon and made a buttonhole for his coin slot, then satin stitched a front and back together, and cut it out with applique scissors. It’s a perfectly precious pink porcine purse or pocket project! I had it finished in half an hour from the time I first saw it this morning! You can bet my family and a few friends are going to get some as gifts! Thank you for this darling project! 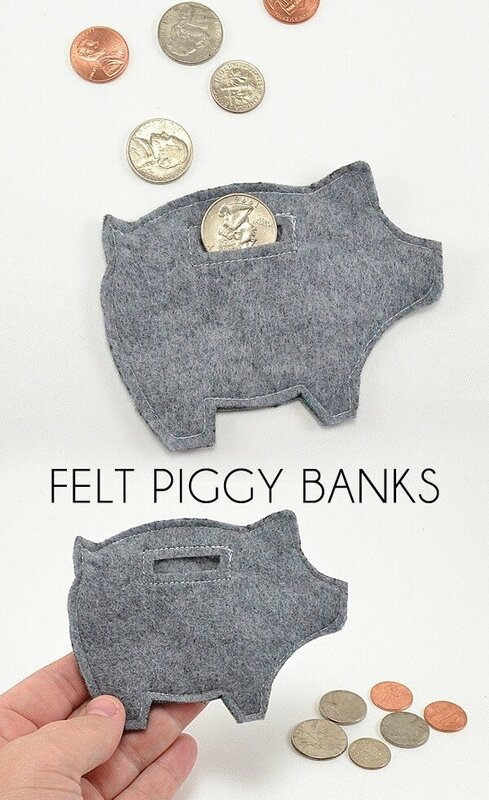 Cute idea, printed out the pig pattern but it would take up half my purse, so might try it as others have mentioned for a gift card. Hey there! You can print the pig to be smaller. Simply save the PDF (right click on the link and save to some place you can find it) and open in adobe acrobat. Start the print job and click “properties” in the pop up window to print. Next click “page layout” on the top tabs. On the upper left hand should be “Reduce/Enlarge document”. Pop in the size (using the percentage, be sure it’s smaller than 100% to make smaller) and you’re all set! I just copied and pasted the image shown here and downsized it so that it is just slightly over 4 inches long. It can be done in any photo editing program online. I have already used my cute pink piggy, and keep it in a pocket on the outside of my purse so that it is easily found. 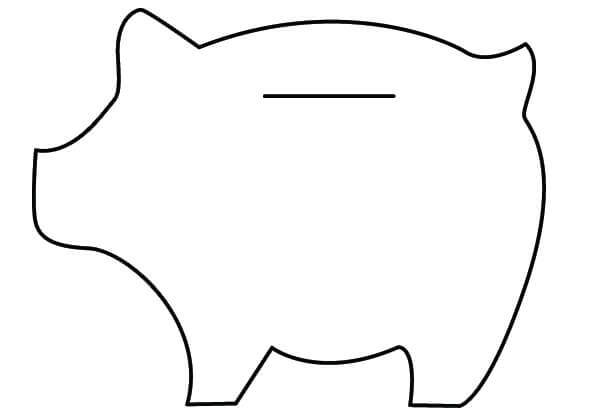 The coin slot is just over an inch long in my downsized pig, and a quarter goes through it easily. Thanks for the tip to print it smaller….I’ll try that too! Great…. did him at 60% and it’s the perfect size, thanks again! 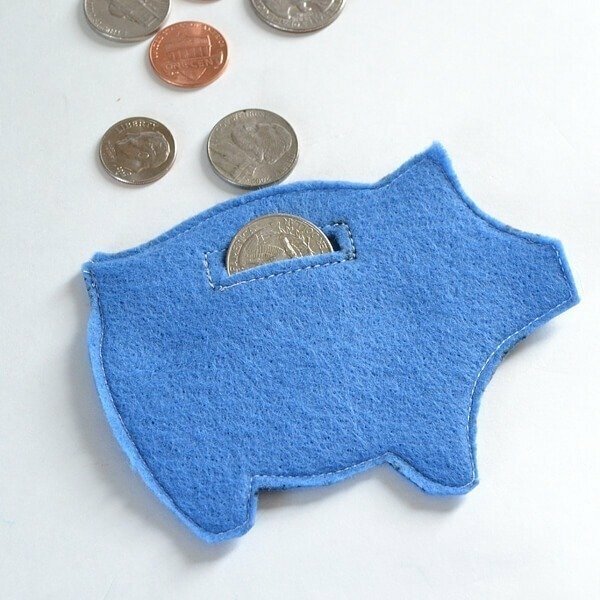 You can find my version of your Felt Piggy Bank today at my blog- of course link to your tutorial. I have used Wilton cookie cutters for years as my templates for many art project, seldom cookies. I think any of those would work, dinosaurs for those who find them hot, to the valentine heart. Thank you for this simple pattern and tutorial. It is always a good feeling to give someone a gift that is handmade, and that they do not already have. this might be a silly question, but how do you get the coins out? Is the hole big enough to reach your fingers down in there and pull the coins out or is it a hassle? It can be kind of a hassle at first but you do get the hang of it. 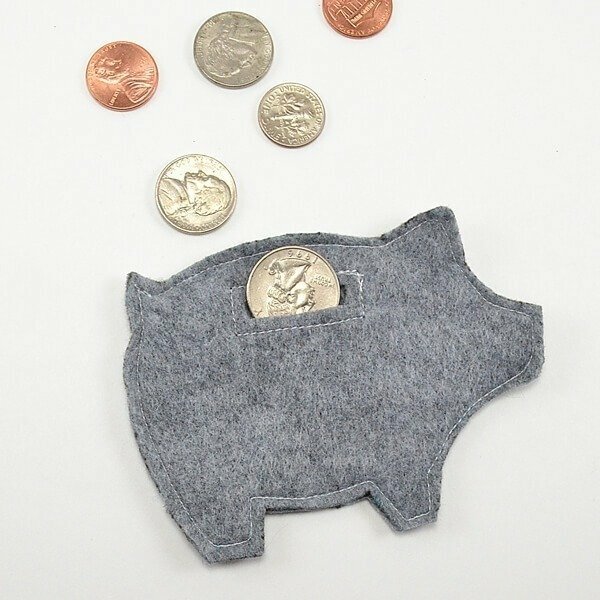 I wouldn’t use this as an every day coin purse when you need to get coins out quickly but you do get the used to kind of pushing them through the slot with time! Adorable! Thanks for the tutorial! I made one of pink nylon fabric, heavily interfaced, and I have carried it in my purse for a couple of years. I love it! When it gets full, I empty it into my secret stash mason jar. I only save quarters in it, so the dollars add up quickly. I’m going to make more for gifts for grownups and my grandkids!